HTML5 Slideshow Maker is a handy slideshow creator designed to create HTML5 slideshows with cool transition effects and HTML5 templates. It allows to add unlimited number of pictures, descriptive texts, hyperlinks, to customize HTML5 templates, to create gorgeous slideshow without any tech knowledge and share to the world. 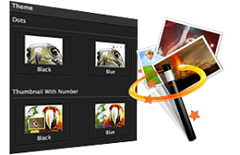 Enable to edit photos, add hyperlinks & descriptions, etc. 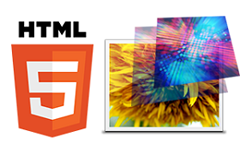 Creating photo slideshows with HTML5 Slideshow Maker doesn't need any technical skills. This HTML5 application has an intuitive interface and navigation that can guide you to take the three simple steps: organize photos, choose HTML5 templates and publish photo slideshows. The default settings in this HTML5 application can help you make a stunning photo slideshow in minutes. 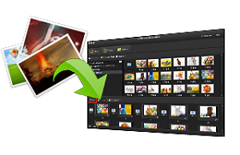 And the flexible customize settings allow you to customize your photo slideshow freely. HTML5 Slideshow Maker has lots of cool built-in HTML5 templates, which makes the process of making a photo slideshow with this HTML5 application become very easy. All the HTML5 templates in this handy HTML5 application are customizable. You can always make a photo slideshow with your favorite HTML5 template. Besides, this HTML5 application also offers dozens of classic and modern transition effects for making your HTML5 photo slideshow more impressive. The HTML5 photo slideshows powered by HTML5 Slideshow Maker are compatible with all the latest version of browsers, including Safari, IE9, Firefox, Google Chrome, Opera. Therefore, after you share your HTML5 photo slideshow on the Internet, you can use iOS devices like iPhone, iPad, Android devices like Samsung mobile phones, Samsung tablets, HTC mobile phones, Windows mobile phones and Google Nexus	series to view your HTML5 photo slideshow.